I have recently returned from several weeks of walking some of Tasmania’s great walks and visiting other wonderful attractions. I am not surprised that Tasmania has just cleaned up in the national tourism awards with 10 awards. We followed a 60 Great Short Walks guide which included major tourist attractions like Wineglass Bay. See the link below: http://www.abc.net.au/news/2015-04-10/tasmania-cleans-up-at-tourism-awards/6385262 The Tasmanian Government estimates tourism in Tasmania contributes around $2.4 billion to the state’s economy each year. While Queensland has significant investment and employment in tourism only 5 awards went Queensland’s way with green attractions Woodford Folk Festival and Bundaberg Turtles amongst them. I think the Sunshine Coast and Queensland could match it with the best of them if we were serious about conserving and promoting our natural environment. We have many wonderful walks like Mount Coolum, Conondale Ranges, Cooloola Wilderness and Hinchinbrook Island to name a few. Wildlife like nesting turtles are not restricted to Mon Repos and further north and we still have wallabies, koalas and amazing native birds in the South East. It is my view that health, wellbeing and eco-tourism are the green advantage as we need to be pursuing a vibrant, green and sustainable future retaining our green edge on much of the Sunshine Coast. 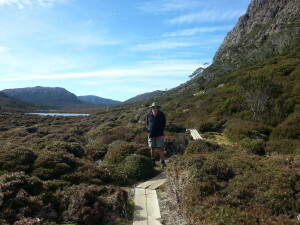 Walking companion Chris and I really enjoyed the 3 day Walls of Jerusalem National Park walk in Tasmania as depicted in the picture following.